Warning: Every moment of history is important, especially the history of science and research. However it is sometimes difficult, even in some occasions impossible, to collect information about the events, persons, projects, etc. It becomes even more difficult when we have conflicting information for the same thing. So, please take this page as the first draft of an unfinished work on history of the department. In the mean time, please keep sending whatever you have got (including pictures) and whatever you know about the department. Thank you. 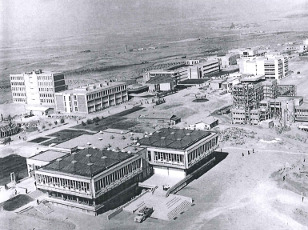 METU Department of Physics has been established as two different departments in 1960: Department of Physics and Department of Theoretical Physics. In 1970-1971 two departments joined together under the name of Department of Physics. 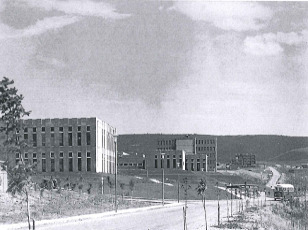 During the first five years (1960-1965) the offices and classrooms were held in the barracks. Offices and classrooms of the Department of Theoretical Physics were located in the Mathematics building during 1965-1968. In 1968-1974 Department of Physics located in S-building; classes mostly held in U-3 complex and in the S-building. The first of the twin Physics buildings was completed by the year 1965. The second one was completed in 1971. The last building which is the P-building was finished in 1978. Ford foundation and AID (Agency of International Development, USA) grants supported in great deal for the establishment of research and educational labs. During the establishment years Nobel prize winners like Gell-Mann, Mössbauer and Lee were among the visiting scientists. Completion of the twin buildings speeded up the construction of the research and educational labs. 1968-1969 Dilhan Ezer (Eryurt) and Paris Pismis visited Department of Physics and started giving astrophysics courses. 1968-1969 Atomic Beam lab was developed by Adnan Şaplakoğlu, Howard Shugart, Tuncay İncesu, Ateş Tezer, Erol Aygün and Atilla Özmen. In 1969, The Atomic Beam Machine has been designed and constructed in the machine shop of the department. The chief technician Hasan Ataizi played a very major role. Howard Shugart from Berkeley also helped in the process. 1968 Mehmet Aydın developed Mössbauer system for research purposes. 1968 After Nuclear Physics has been initiated Nuray Büget, Ahmet Gökalp, Aydın Kolat and Ertan Akşahin were involved into the subject. 1969- After High Energy Physics has been initiated Suha Gursey, Meral Serdaroğlu, Avadis Hacınliyan, Metin Durgut, Mehmet Koca, Cihan Saçlıoğlu and Hüseyin Akçay were involved into the subject. 1970 Yeter Göksu and Mustafa Özbakan started the work in C-14 Lab. 1971- After Mathematical Physics group has been initiated, Yavuz Nutku, Metin Gürses, Rahmi Güven, Ahmet Eriş, Tekin Dereli, Selçuk Bayın and Yurdahan Güler were involved into the subject. 1972 Plasma Physics Lab. was founded by Ordal Demokan. 1972-1980 After the completion of department's twin buildings, teaching labs; general physics, optics, electronics, nuclear physics, modern physics were settled down. Tuncay Incesu, Gülay Öke, Atilla Özmen, Esen Özsan, Ziya Sümengen, Yurdanur Tulunay, Ümit Kiziloglu, Erdogan Apaydin, Ahmet Ecevit and Sinan Bilikmen contributed great deal in the process. 1973 Theoretical astrophysics gained momentum from Jean Swank and Halil Kırbıyık. High Energy Astrophysics has been established by Hakkı Öğelman, Tümay Tümer, Ed Utiger, Ümit Kızıloğlu, İlhami Yeğingil and Mehmet Emin Özel. 1974-1984 After Neutron Transport group has been initiated Ali İmre Usseli and Cevdet Tezcan were involved into the subject. 1975 Solar Energy lab was founded by Hakkı Ögelman and Ahmet Ecevit. 1975-1980 Semiconductor Technology lab gained momentum. Ziya Sümengen, Mehmet Rona, Hüsnü Özkan and Ersin Özsan played an important role in the begining. 1975 The first computer, INTERDATA, was ordered by Ed Utiger. The first computer room was established by Ed Utiger, Ümit Kiziloglu, Faruk Tokdemir. The computer was upgraded in 1978. Şakir Erkoç, Şinasi Ellialtıoğlu, Atilla Erçelebi and Cemal Yalabık were involved into the subject. 1979- After Plasma Physics group has been initiated Serhat Çakır, Gülay Öke and Sinan Bilikmen were involved into the subject. 19-- After Atmospheric Physics has been initiated Gülay Öke, Erdogan Apaydın and Davut Köşker were involved into the subject. 1980-1985 Semiconductor Technology Lab, with the great contributions of Bayram Katırcıoğlu, İbrahim Günal and Çiğdem Erçelebi, gained momentum and reached its present recognition as one of the distinguished solid state research facility in the country. 1980 Thermoluminescence Lab. was developed by Naif Türetken. 1980 ESR Lab. was developed by Ay Melek Özer. 1986 The first PC was bought. 1991 A small observatory was built on campus with the support of Dilhan Eryurt-Ezer, Halil Kırbıyık and Ümit Kızıloğlu. Ali Alpar joined the astrophysics group. 1991-1992 Departmental and Faculty network and Banyan server was founded. The first UNIX cluster (newton and others) was established. The first student computing lab was established: 16 PCs with 286 CPU. 19-- Selective Surface Lab was founded by Ahmet Ecevit and Bülent Akınoğlu.